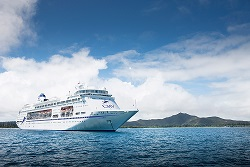 British based cruise operator, Cruise & Maritime Voyages (CMV), is pleased to announce the addition of Pacific Pearl from P&O Cruises Australia to the CMV fleet commencing cruise operations on Friday 9th June 2017 as the re-named Columbus. Under CMV’s explorer theme, Columbus will be dedicated to cruising in the Northern Europe market, homeporting year round from London Tilbury and providing a more traditional destination focused cruise experience. At 63,786grt and with an impressive space ratio, she will carry about 1400 passengers accommodated in 775 cabins (including 150 singles) and will become the proud new flagship of the CMV ocean fleet operating alongside Magellan (1300pax), Marco Polo (800pax), Astor (600pax) and Astoria (550pax). Columbus will also be targeted to the adult only (16yrs plus) market although in summer 2017 will be operating two selected August summer holiday sailings for all age groups. The ship was originally launched in 1989 and christened by Hollywood actress Audrey Hepburn on 4th March. He added, “The strategic development of the Group’s presence in the UK and wider international markets will increase our overall capacity to 120,000 passengers in 2017. John Dennis, Vice President Sales and Marketing CMVUSA commented, “We are really pleased to welcome this fine ship to our fleet which we believe will be very well suited to our growing North American passenger source market who appreciate and value the many benefits of cruising on smaller to mid-sized more traditional vessels of this type. The 2017 summer program will go live ON SALE via the CMVUSA website on Thursday 31st March 2016. Special introductory fares with enticing early booking deals to reward early bookers will be on offer plus a 25% single supplement deal with 150 dedicated single cabins being made available for the growing solos market. Attractive group deals offering further savings, free places and other benefits, will be available.